David Cameron opened Liverpool’s International Festival for Business in June claiming it is the ‘biggest showcase of British industry since 1951’. As any good architect knows, the 1951 Festival of Britain left a legacy of great design, some in the flesh, such as the Royal Festival Hall, others, like the Skylon, surviving just as an inspirational memory. Mann Island, the hub of the International Festival of Business and home next year to RIBA North. Based in its city waterfront hub in the Broadway Malyan designed Mann Island – where Alsop’s Fourth Grace, the Cloud, was once planned – this festival is focused on an economic legacy and giving a platform for the skills and manufacturing of the north west. Its base demonstrates the new paradigm; the docks, once the centre of the UK’s transatlantic trade, are now populated with cultural institutions and attractions. Here is the Tate Modern, the Museum of Liverpool Pier Head. Under the apartments of the black clad angles of Mann Island, RCKa’s Open Eye Gallery is already in place. By May 2015 it will have been joined by RIBA North with its new museum standard gallery for showing the best of precious architectural artefacts and the City Gallery, allowing the public to engage with both the physical and the digital city models. This Arup 3D model, commissioned by the council, is important not just for the public but also for those working in the city. Some practices already have their own models of areas that are particularly relevant to their work. Ryder has one for the area around the Metropolitan Cathedral where it has completed a number of Liverpool Science Park buildings, but going beyond that zone requires getting the laser measure out or, more likely, buying or commissioning a 3D model from a company like Zmapping. 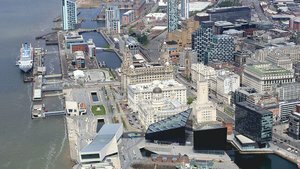 For access to the Liverpool digital map, Arup, as custodian, just asks for a 3D model of the end building to be supplied to keep its own city model up to date. Much of the export strategy for architecture has relied on the promise of British creativity. But some hard-won digital skills are also expected to give British architects the edge overseas in the next few years, driven by Britain’s largest client, the government, with its BIM strategy. Being given the impetus to invest in software, and the training in the new processes that are needed, is pushing British architects ahead – there are arguments that the planning system should follow. Earlier this year a UKTI mission to South East Asia attempted to capitalise on these skills. After all, once you have all that data, mobile records, geographically located tweets and Facebook likes, traffic flow information and those models, why not do something extra clever with it? Huge electronics and computing companies like Seimens and IBM have got their heads around infrastructure and are busy selling smart cities, utilising big data, to mayors and councils across the world. Urban designers and architects are still battling with what it means. Two recent publications from the RIBA give an idea of the direction we are taking. The joint report with Arup, ‘Designing with Data’, called for the metadata that is generated to be used to make better cities by designing for citizens; to allow experimentation and testing of options to save time and money during construction; and to encourage transparency opportunities on sites. The think pieces that followed in ‘Digital Planning’ went further, exploring the potential impact on the planning system. Tim Stonor of Space Syntax pointed out the importance of not just using such data to visualise the existing situation but to balance different considerations in planning to help understand how spatial planning ‘inputs’ affect ‘outcomes’ like land value, movement, crime risk and so on. Back in Liverpool, Friends of the Flyover is hoping that its crowd funded feasibility study on turning unwanted flyovers into park and community space will benefit from the big data analysis on urban flows that Mott MacDonald is undertaking. The city centre movement strategy will look at optimising the transport infrastructure. Architect Mark Bennett is one of the three people behind Friends of the Flyover, which is in discussions with the council about how to reuse these impressive but unloved structures to draw the museum quarter and ‘Arc of Opportunity’ closer to the northern areas around Liverpool John Moores University, which are currently ghetto-ised by the barrier of the 1960s road system. The crowd funding, via web platform Spacehive, has given them an extra lever with the city fathers. ‘Crowd funding is like a mini referendum,’ says Bennett. The group hit its £40,844 target on the anniversary of the Hillsborough disaster, and is now pushing on with the project, with planning submission in their sights and profile-raising events lined up on the structures. For Matt Brook, who runs the distinctive Liverpool studio of Broadway Malyan, city modelling is critical to giving both client and public an accurate view of the building in its context. As designer of Mann Island, he suffered a huge amount of vitriol over the way it would sit with the Three Graces, Liverpool’s trio of historic waterfront buildings. For someone who always wants to take an urban design led approach this was hard. He sees Liverpool as having got to the starting point of having a city model. The issue then is access to the model and adding layers to it. Knowing how an urban space might be affected when there is a big football match or an event at the Echo Liverpool Arena would make his job a lot easier. And being able to interrogate the material in a visual way, without needing a special skill to do so, would make it an incredibly valuable tool. ‘A digital city is all about optimising a design,’ he says. ‘Buildings are a huge investment.’ And he also has an exciting virtual reality research collaboration up his sleeve to make the visualising even easier (see box).